Every WDW veteran I know looks forward to trying something new that the resort has to offer: the newest attraction, the restaurant that just opened, the exclusive tour that’s hard to book. The Ferrytale Fireworks: A Sparkling Dessert Cruise is one of the latest offerings at a resort complex full of thousands of things to do. Bottom line: it’s a great idea for veterans (especially those without young children) who are looking to try something different. For first-timers and those who don’t feel like they’ve "seen it all" yet, skip this pricey excursion and spend more time in the parks. If there’s one thing Walt Disney World likes to do, it’s dessert parties: they’ve got ‘em in nearly every park on any given night. For an extra fee, you get access to a reserved location (sometimes with coveted seating?!? ), some gourmet desserts, perhaps some adult beverages, and best of all: a great viewing spot for the fireworks. With this dessert cruise, WDW has combined their classic dessert party model with a riverboat cruise on the Seven Seas Lagoon. The Ferrytale Fireworks: A Sparkling Dessert Cruise sets sail a few nights a week (currently it's on Monday, Thursday, and Saturday) during the Magic Kingdom’s fireworks show on the General Joe Potter, one of the ferryboats used day in and day out to shuttle guests between the Magic Kingdom and the Transportation & Ticket Center. At night, the Potter gets spiffed up for this new nautical event: hightop tables, a bar, dessert stations, even a restroom (albeit a simple “one-holer”) is added. It looked to me that the decks had been thoroughly swabbed and General Joe cleaned up nicer than I expected. You have to reserve your spot on the cruise in advance, and there are only 150 spots each night. You book like any other WDW Advance Dining Reservation, and they hold your spot with a credit card. The exclusive, limited crowd was important because the two decks of the boat were fairly crowded with only 150 people. Granted, the number of Cast Members on board to serve us guests was probably 30-40, which made it seem rather full as well. The main fare is a spread of bite-sized classic desserts from around WDW, featured at the various parks and resorts, along with wines, beer, champagne, sparkling cider. Come hungry because there’s plenty to eat and drink as you cruise the lagoon. We were asked to arrive at 8:45 p.m., boarded at 9:00 p.m., and the boat pushed off from the TTC around 9:10 p.m. As we arrived, there was a section by the ferry dock cleared marked off for those on the Ferrytale Cruise. Cast Members were greeting each party of guests individually, orienting everyone, and welcoming us. We were each given a glow-in-the-dark necklace, and a glass of sparkling cider in a souvenir glow-in-the-dark plastic toasting flute. The Cast Members did warn us that there was only one restroom onboard, and jokingly reminded us to use the nearby land-based facilities before boarding. The way we were welcomed made us feel special - a little VIP experience amidst our otherwise crowded and pedestrian day. The cruise lasted about an hour. The captain made a special point to situate the boat for a great view of one of WDW’s largely unseen wonders: the Electrical Water Pageant. This venerable nightly show of floats on the lagoon is seen only by those on the ferry or outside one of the Magic Kingdom resorts. While nowhere near as neat as its cousin, the (now gone) Main Street Electrical Parade, the water pageant is a nice look back in time. As the Electrical Water pageant faded and floated away, the captain then cruised around the lagoon until the fireworks show began. He narrated some of the history of the resort with some fun facts about the lagoon, backed up by nice background music for an elegant night out on the water. Throughout the evening, the lower level served as the bar and the upper level as the dessert station. For those not partaking in wine, there was special fruit punch (which they were happy to spike with vodka if you liked), as well as coffee, tea, hot chocolate, and citrus water. New for 2018: 2 new specialty punches - Firecracker Fizz and The Grand Finale. Someone mentioned soft drinks as well, which I never saw, but I’m sure one of the eager Cast Members would provide upon request. Beer lovers need not apply: the only choices were Miller Lite and Bud Light Lime, albeit in nice aluminum bottles! At least it was all-inclusive. In addition to the dessert spread, there was fruit, cheese and crackers, all spread out in a quite elegant fashion. In addition to these, Cast Members were providing Mickey bars and Mickey ice cream sandwiches to the kids, and even adults by request! While I don’t recommend this cruise for children (more on that later), the Cast Members went above the call of duty to keep the kids entertained. With sparkling cider to drink in the same "glow glasses" as the adults, an unlimited supply of Mickey bars as well as the other desserts, there was no shortage of sugar for the kids. To top it off, the cast had decorated the General Joe with “invisible ink” Hidden Mickeys, and provided all the kids with special flashlights to hunt around the ferry to find them all. Balloons were parting gifts for the kids, who all seemed to have enjoyed their evening at sea. New for 2018: Guests young and old will also be entertained by a magician that will stroll around performing small tricks as the party goers await the fireworks. The evening reached its highpoint as the boat found the optimum viewing spot in the lagoon for the Magic Kingdom fireworks. With a vantage point right between the train station and the castle, we had a great view for the fireworks. On this night, Mickey’s Not-So-Scary Halloween Party was taking place, so the show was Happy Hallowishes, which is a fantastic fireworks show and a nice changeup from the regular Wishes. Note: Wishes was retired in May 2017 as the nightly fireworks show at Magic Kingdom. The current fireworks show (outside of Mickey's Not-So-Scary Halloween Party and Mickey's Very Merry Christmas Party is called Happily Ever After. With music "piped in" to the boat for this fireworks spectacular, it was a great way to take the pyrotechnics in. One advantage to being outside the park itself was that we could easily see all the fireworks, including some off to the side away from Main Street, over the lands at the perimeter of the Magic Kingdom. I’m guessing that watching the Christmas party fireworks from the ferryboat would similarly be a great experience if you can cruise one of those nights. Another nice touch was a few PhotoPass photographers on board to capture some great pics on their or your camera. A final wonderful surprise was special buses right from Transportation and Ticket Center to take you anywhere in the resort you wanted to go. Staying at a WDW resort not on the monorail loop, we assumed we’d have to make our way from TTC to either Epcot or MK and then catch the appropriate bus. They had thoughtfully brought 4 buses to transport us quickly and efficiently to our resort. OK…so no review is complete without the negatives. First, seating was incredibly limited. Basically what you see on any ferryboat cruise is what you get for the dessert cruise – no additional seats that I could tell. This is a problem that needs to be addressed, because after a long day walking through the parks, who wants to stand for another hour, especially while trying to balance a plate of dessert, a glass of wine, all on a boat?!?! Second, while desserts and drinks were plentiful throughout the first part of the evening, once the fireworks began at 10 p.m., all the food and drinks were cleared out while we were all distracted watching the fireworks. No notice was given, so I’m glad I scored one last beverage and one more dessert around 9:55 p.m.
On the way out, glasses of water were available (which I gratefully accepted!) and Mickey bars were one final souvenir for the ride home. Finally, I have to comment on the price. At $99 for each adult and $69 for each child, it’s a steep price tag, even at Disney pricing levels. Knowing that the ferryboat ride is free any other time, and $69 buys a lot of Mickey bars or anything else Junior might want, I’d recommend this for adults only. While my 8-year old and 4-year old would have probably enjoyed themselves (and stuffed themselves on dessert! ), I think we could have spent the $140 better on them. Bottom line: this makes for a nice relaxing, elegant, romantic night on the water. 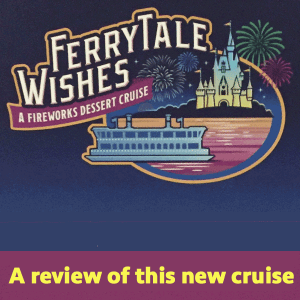 If you’re a WDW veteran looking for a new thing to try, like desserts and drinks, and you’re looking for the best view of the fireworks south of Bay Lake Tower, I can recommend the Ferrytale Fireworks: A Sparkling Dessert Cruise. I have a kid who LOVES fireworks but HATES the noise associated with them (Our last trip we spent MK fireworks in Dumbo’s Tent and we left Illuminations within 3 minutes.). How are the firework noise levels here at this event? Too much? Would we be better off doing the fireworks viewing at the Contemporary? I’m willing to pay some money for the experience of fireworks without the fear of the noise. My husband and I went on the Ferrytale Wishes Cruise the begining of January. I have to agree with much of this post. We loved the unlimited desserts, and drinks, the black light Mickey scavenger hunt, and all the other special details that went into making this a fun new twist on the Disney firework dessert party. We are big Disney pin collectors/traders so we loved that we got an exclusive Ferrytale Wishes Cruise pin. However, the night we went we had a horrible time seeing the Wishes show. I’m not sure if it was just a one time fluke but our boat was quite a ways back in the lagoon. For the price tag I hoped we would of been a bit closer, while nothings like being on Main Street in the middle of the action, we couldn’t even get a clear shot of the castle and that includes the photo’s taken by the Photo Pass Photographer (the photo included in this post of the train station and castle would of been a perfect view compared to ours). We werent even able to enjoy the castle light effects. We also weren’t taken by the Water Electrical Parade so I wouldn’t expect that on every trip. We arrived according to the time on our confirmation email, about 15 minutes before departure, and we weren’t given the lighted flutes or neckalaces at check-in, because they were already packed away, we had to speak to the boat Captian when we got on the ship and he was able to finally get us each one. So arrive at least half hour before departure. If you decide to take this voyage and are looking for a uniqe souvenir: the sugar Cinderella’s slipper is a great keepsake. Take it home and spray it with a clear adhesive and it will preserve the slipper for a long period of time. Take advantage of the Photo Pass Photographer on board, get a picture with the fireworks in the background and one with the Ferrytale Cruise props you’ll be glad you did! 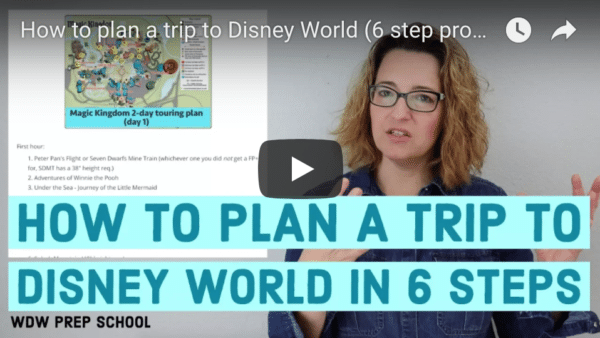 I just added another day to our upcoming 6 day Spring Break trip, so that we can go to MK the evening of our arrival and see WISHES. I figured we can start off our trip with a bang. Then I inadvertently saw where someone had done this. It sounds neat and would certainly offer fabulous views of the fireworks. I am going to try the FP for WISHES for the first time. I would have done this, but it is too expensive for what it offers. Shame. Hi, I take it you do not have to be in the park in order to reserve for a cruise? Would like to take my wife as a surprise when we’re there this coming NYE 2016/17 on an off day as we will be staying at our timeshare this trip. Also, would it be prudent (as well as frugal) to park our car at DTD (not used to the name Disney Springs yet) and hop a bus to MK as long as we leave plenty of time to get there? We would be going there after anyway. Thank you for all the info you’ve provided! Do you know if this new cruise changes or affects at all the private, pontoon boat Wishes Cruises that occur in the lagoon? We have a 10 person birthday cruise coming up in February. I don’t think this should affect your pontoon journey at all. Different watercraft/cruises each have their own designated area to watch the fireworks. Enjoy your cruise!